What are hydrofluorocarbons (HFCs) ? Hydrofluorocarbons (HFCs) are compounds containing carbon, hydrogen, and fluorine. Certain chemicals within this class of compounds are viewed by industry and the scientific community as acceptable alternatives to chlorofluorocarbons and hydrochlorofluorocarbons on a long-term basis. Because the HFCs contain no chlorine they do not directly affect stratospheric ozone. Furthermore, mechanisms for ozone destruction involving fragments produced as HFCs are decomposed within the atmosphere (CF3 radicals) have been shown to be insignificant. Like HCFCs, the HFCs contain hydrogen that is susceptible to attack by the hydroxyl radical. Oxidation of HFCs by the hydroxyl radical is believed to be the major destruction pathway for HFCs in the atmosphere. Atmospheric lifetimes of the most commonly used HFCs (HFC-134a and HFC-152a) are limited to <12 yrs because of this reaction. Although it is believed HFCs will not deplete ozone within the stratosphere, this class of compounds has other adverse environmental effects (see the Chlorofluorocarbon Alternatives Measurement Project info)-for example, these gases are efficient absorbers of infrared radiation. Concern over these effects may make it necessary to regulate production and use of these compounds at some point in the future. Such restrictions have been proposed in the Kyoto Protocol. How have atmospheric concentrations of HFCs changed over time? 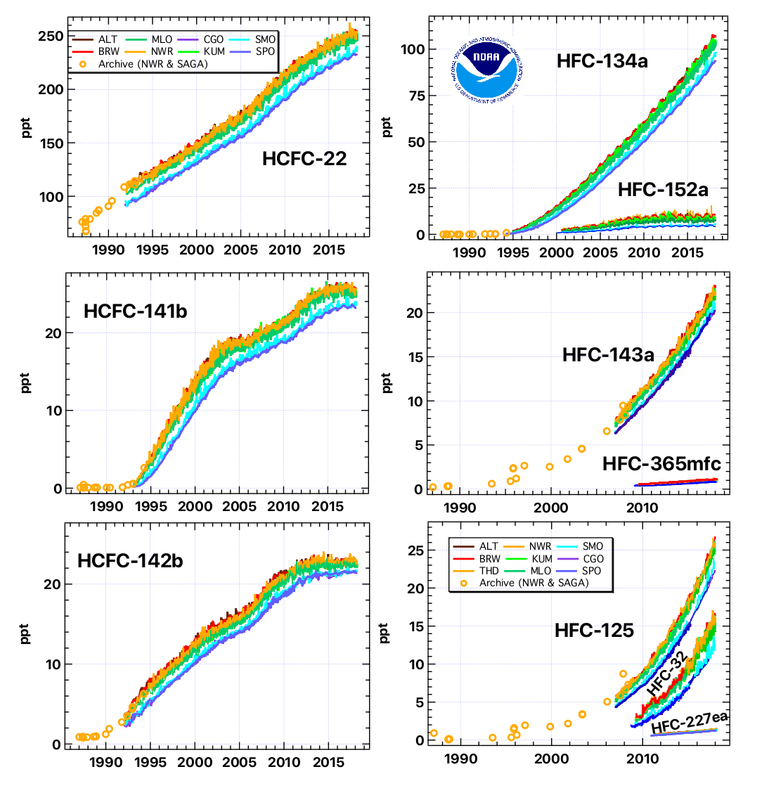 Regular, careful measurements of air from remote locations show that global concentrations of HFCs have increased rapidly over time (Figure 1). This increase can be attributed to enhanced use of HFCs as substitutes for CFCs, HCFCs, and other chemicals as solvent/cleaning agents, refrigerants, foam-blowing agents, air conditioning fluids, etc., beginning in the late 1980s and early 1990s. Measurements of air stored in containers that were originally filled as early as 1977 and measurements of even older air trapped in snow above Antarctica or Greenland have allowed scientists at NOAA, CSIRO (Australia), and the University of East Anglia (UK) to reconstruct how concentrations of these gases have changed in the atmosphere over the past 100 years. The picture that emerges is one in which HFCs did not exist in the atmosphere until they were manufactured by industry. Once their use was encouraged to aid in accelerating the phase out of CFCs and HCFCs, HFC concentrations increased rapidly from zero to the amounts observed today. Dr. Stephen A. Montzka; phone: (303)-497-6657.